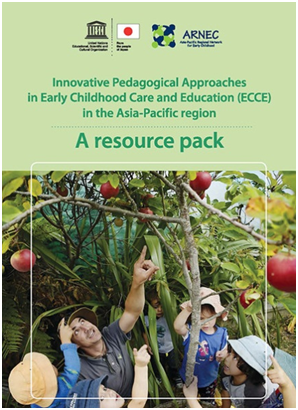 The Innovative Pedagogical Approaches in Early Childhood Care and Education (ECCE): A Resource Pack includes case studies from nine countries. Each is an example of an innovative pedagogy developed according to a specific context and with concern for sustainable learning.This resource pack discounts the idea that ECCE should solely rely on a “universalized ‘one size fits all’ model" and emphasizes the need for ‘real-life’ approaches that connect children with their communities. Innovations in ECCE in the Asia-Pacific region are often intended to improve not only the lives of children but also those of the entire community. These examples of transformational pedagogy are inspirational reads for practitioners, researchers, and policymakers.